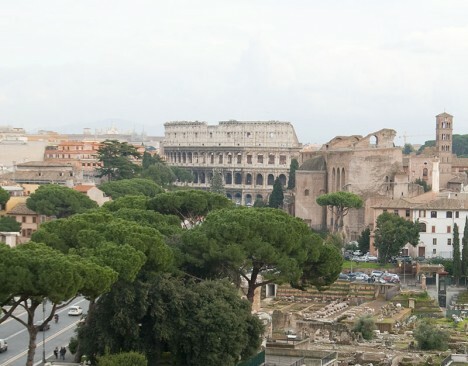 Colosseum is one of Romes most well known attractions. The Grand opening of the arena took place at 80 AD by Caesar Titus. The name came from the giant (colossal) statue of Nero that stood beside the place of the arena (the statue is no longer there). At the Colosseum thousands of gladiators and animal was killed during the years it was used. Only at the opening ceremony that took a year, it is believed that 2 000 gladiators and 9 000 animals was “slaughtered”. The perimeter of the Colosseum is about 524 meters and it is 48 meter high and could take 55 000 spectators. Colosseum is one of the places you must visit when you are in Rome. Rome map with the location of Colosseum, one of Romes most known attraction.